Well, it’s not really new, but it’s new to me. I spent most of the evening out in the shop cleaning and organizing my tools in this “new” box. It must be some throwback to caveman days. I wonder if Ugg organized his clubs and flint knives after a big hunt. Don’t laugh ladies. It’s not just a man thing. You gals like to organize your sewing kits or crafts tools and stuff. Don’t be smirking. I understand. I enjoy organizing my sewing box every so often. Yeah… the biker know how to sew; by hand or machine. I actually have my own sewing machine, too. I got the new one all cleaned and oiled and filled with tools. Now my old box seemed forlorn. Not to worry, I rolled the little guy into my electronics shop and loaded it up with all the tools in there. Now, it’s happy again. Ah… tools. What would a manly man do without them? It was comforting to fondle my tools this evening. I should do it more often. 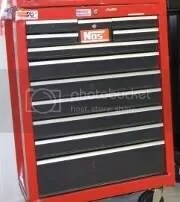 Posted by V. T. Eric Layton on 24 November 2010 in Around the Home and tagged Craftsman, organize, shop, toolbox, tools. Congrats Eric! Always great to get a new box to organize things in! I doubt it, but we are the few that post comments LOL! NO! I read it too! Ok, maybe not everyday….but hey what do you want? I am quiet you know. oops, I forgot (isn’t that different?) the main reason why I posted in the first place…I wanna read about the tree story too! Very nice Eric!!! That is a nice looking toolbox. Eric, guys who can sew … and who even own their own sewing machines … are not as uncommon as most people think. I’m one. Yes, I’ve got a sewing machine of my own. It cranked out lots of costumes, back when I was still involved in live roleplaying and in theater. It’s probably not as uncommon as most would think. It’s just that few men would admit it. 😉 To be honest about it, I’m not Seamstress Suzie when it comes to the quality of my sewing, but I can mend, hem, sew a button one, etc.